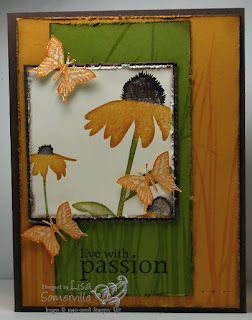 I just barely got my suitcase unpacked, and remembered I hadn't done MJ's challenge before I left....So I grabbed my new Inspired by Nature Set and Dreams du Jour to create the following card for this weeks challenge. 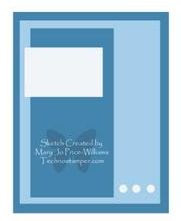 Here's MJ's original sketch...if you'd like to play along leave a link to your creation here, or if uploading to SCS, please use keyword TSSC29. That is just wonderful! I think I recognize that More Mustard background, don't I? GREAT card! Oh my goodness! I can not wait to get that set. Great card, great colors. Thanks for playing. Beautiful card Lisa!! Love how you incorporated the 2 sets together, they work so perfect together! GORGEEEEEEEEOUS! super pretty! Can't wait to see the new catty! I just bow down to you Lisa! I have only begun to unpack - let alone stamp anything and here you are with this wonderful, beautiful card that I'm so going to case for my camp on Saturday! Love you honey!